Data from PROMISE were used to assess the efficacy of CT angiography in patients with diabetes. 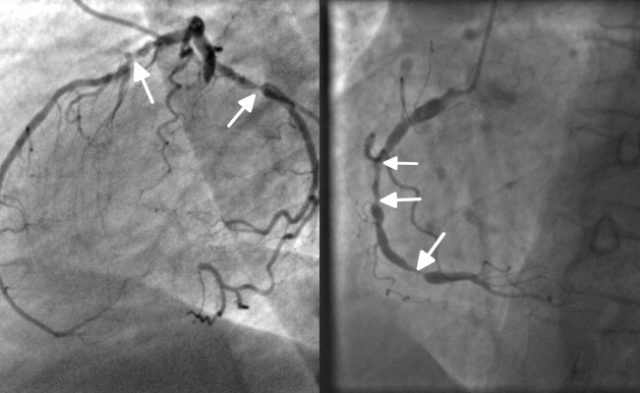 Worse cardiovascular outcomes are often present in patients with diabetes, but computed tomographic angiography (CTA) may provide sufficient information to mitigate poor outcomes, according to research presented at the 66th Annual Scientific Session & Expo of the American College of Cardiology. Researchers from the Duke Clinical Research Institute in Durham, North Carolina, used data from PROMISE (PROspective Multicenter Imaging Study for Evaluation of Chest Pain; ClinicalTrials.gov Identifier: NCT01174550) to examine cardiac outcomes following noninvasive testing. The study included 8966 patients with symptoms of stable coronary artery disease (CAD; 21% with diabetes); 4500 underwent CTA and 4466 underwent stress testing. The primary study outcome was death, myocardial infarction (MI), and unstable angina hospitalization. The secondary outcome was cardiovascular death or MI. Overall, patients with diabetes had more cardiovascular risk factors and higher rates of noninvasive testing positivity (15% vs 11%; adjusted P =.01) as well as 60-day aspirin, statin, and angiotensin-converting enzyme inhibitor/angiotensin receptor blocker use (all adjusted P >.1). However, both groups had similar rates of catheterization (13% vs 9%; adjusted P =.10) and revascularization referral (48% vs 45%; adjusted P =.9). Diabetes was associated with higher rates of both primary and secondary outcomes (adjusted hazard ratio [aHR]: 1.6 and 1.5; P =.002 and .004, respectively). Patients with diabetes also experienced “substantially lower” risk of cardiovascular death/MI with CTA vs stress testing (1% vs 2.6%; aHR: .04; P =.008), while patients without diabetes experienced similar outcomes whether undergoing CTA or stress testing (1.4% vs 1.3%; aHR: 1.0; P =1.0). “The information provided by CTA may allow better optimization of management in [diabetes],” the researchers concluded, noting that the same effect was not present in patients without diabetes. Sharma A, Sekaran N, Coles A, et al. Outcomes in patients with diabetes mellitus and suspected coronary artery disease following non-invasive testing: insights from the PROMISE trial (PROspective Multicenter Imaging Study for Evaluation of Chest Pain). Abstract 1126-319. Presented at: the 66th Annual Scientific Session & Expo of American College of Cardiology. March 17-19, 2017; Washington, DC.